team-work is improved (persistent human-robot teaming). To realise its main concept, TRADR formulates three scientific objectives. Persistent environment model: Develop S&T for the gradual construction of models of dynamic environments, fusing multi-modal observations from different kinds of robots, possibly operating asynchronously across multiple sorties during a mission. Persistent models for multi-robot acting: Develop S&T for the gradual adaptation and grounding of individual- and multi-robot task-level planning and execution within and across sorties, to reflect experience with operating in the disaster area. Persistent models for human-robot teaming: Develop S&T for the gradual adaptation of an individual robots social skills to reflect experience with collaborating within a human robot team. 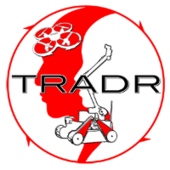 The TRADR use cases involve response to a medium to large scale industrial accident by teams consisting of human rescuers and several robots (both ground and airborne). TRADR missions will ultimately stretch over several days in increasingly dynamic environments. 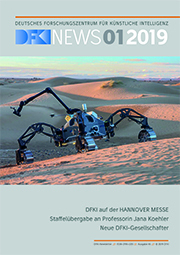 In: Proceedings of the Companion of the 2018 ACM International Conference on Human-Robot Interaction (HRI). ACM/IEEE International Conference on Human-Robot Interaction (HRI-2018) March 5-8 Chicago Ilinois United States ACM 3/2018. In: International Journal of Electrical, Computer, Energetic, Electronic and Communication Engineering 11 6 Seiten 544-548 World Academy of Science, Engineering and Technology 6/2017. In: Kamilo Melo (Hrsg.). Proceedings of the 2016 IEEE International Symposium on Safety, Security and Rescue Robotics. IEEE International Symposium on Safety, Security and Rescue Robotics (SSRR-2016) October 23-27 EPFL, Lausanne Switzerland Seiten 278-279 ISBN 978-1-5090-4349-1 IEEE 10/2016.